On January 14th 2020, Microsoft will be officially ending extended support for Microsoft Windows 7. All your computers should now be running Windows 10 by this point. When a product is in a supported state, specifically Microsoft Windows, Microsoft is currently and actively supporting the product. They are releasing security updates and patches to keep the product secure, creating updates to make sure the product is functioning properly and in a stable fashion, and supporting the products use by making sure it’s working with other Microsoft products. Typically software, operating systems, and technologies eventually fall out of support. This means that Microsoft will no longer work to secure that product, update the product, and make the product better. This is because the product has been replaced by something newer, or is no longer supposed to be in use. Microsoft Windows 7 has been replaced by Microsoft Windows 10 and users should upgrade before support is ended on January 14th 2020. At this point if you’re running Windows 10 on all your workstations, you have nothing to worry about (as long as you’re keeping them up to date with Windows updates). However, if you’re running Windows 7 on any of your computers, you’ll need to start planning to either upgrade them, or replace them with new Windows 10 computers. 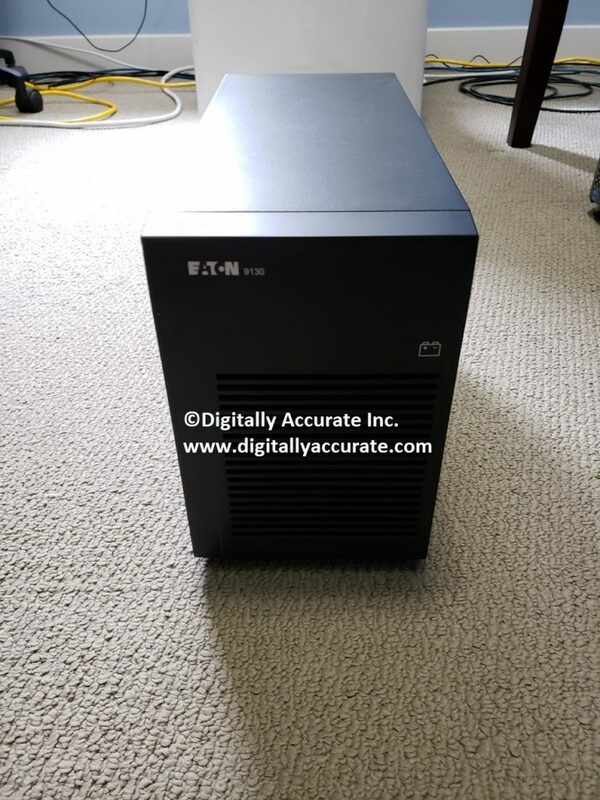 Chances are if the computers are old enough to be running Windows 7, the hardware is old enough that it may be better to do a workstation refresh and purchase new computers that ship with Windows 10. You’ll also need to make sure that all the applications that your business uses (line of business applications) are supported and work on Windows 10. Some companies are behind on releases of major software packages, and some of these programs may have worked on Windows 7, but require an upgrade to work on Windows 10. You’ll need to test all your applications on Windows 10 before doing a companywide upgrade. You’ll also need to make sure that your server infrastructure can support Windows 10 client PCs. As an example, some businesses are still using Microsoft Small Business server, which requires modifications for it to function with Windows 10 PCs. You’ll need to make sure you’re fully setup to run Windows 10. Even though it may seem like there’s a bunch of time before January 2020, it flies by quick and we recommend to start your migration project soon. When you add up the time it takes for application compatibility testing, ordering of new computers and delivery times, configuration and deployment of the new computers, and post migration support, you’ll already be creeping up on the EoL (End of Life) date of January 14th 2020. Contact us if you need help planning or executing your Windows 10 upgrade migration project! In the ever-evolving world of IT and End User Computing (EUC), new technologies and solutions are constantly being developed to decrease costs, improve functionality, and help the business’ bottom line. In this pursuit, as far as end user computing goes, two technologies have emerged: Hosted Desktop Infrastructure (HDI), and Virtual Desktop Infrastructure (VDI). In this post I hope to explain the differences and compare the technologies. We’re at a point where due to the low cost of backend server computing, performance, and storage, it doesn’t make sense to waste end user hardware and resources. 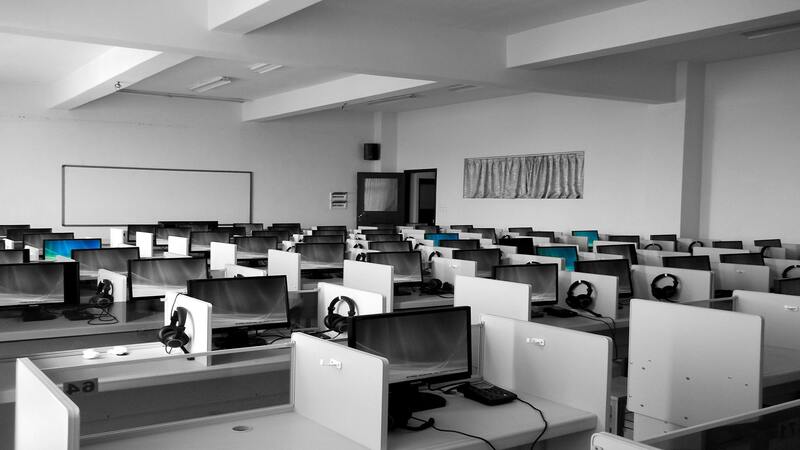 By deploying thin clients, zero clients, or software clients, we can reduce the cost per user for workstations or desktop computers, and consolidate these on the backend side of things. 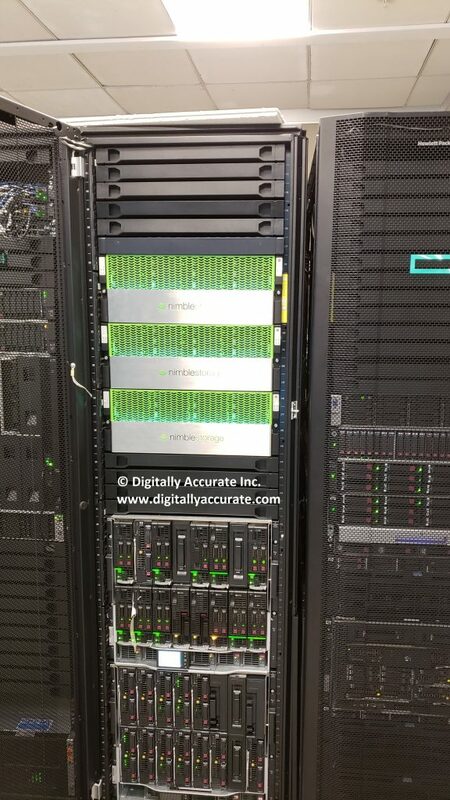 By moving moving EUC to the data center (or server room), we can reduce power requirements, reduce hardware and licensing costs, and take advantage of some cool technologies thanks to the use of virtualization and/or Storage (SANs), snapshots, fancy provisioning, backup and disaster recovery, and others. And it doesn’t stop there, utilizing these technologies minimizes the resources required and spent on managing, monitoring, and supporting end user computing. For businesses this is a significant reduction in costs, as well as downtime. Many IT professionals still don’t fully understand the difference between HDI and VDI, but it’s as sample as this: Hosted Desktop Infrastructure runs natively on the bare metal (whether it’s a server, or SoC) and is controlled and provided by a provisioning server or connection broker, whereas Virtual Desktop Infrastructure virtualizes (like you’re accustomed to with servers) the desktops in a virtual environment and is controlled and provided via hypervisors running on the physical hardware. 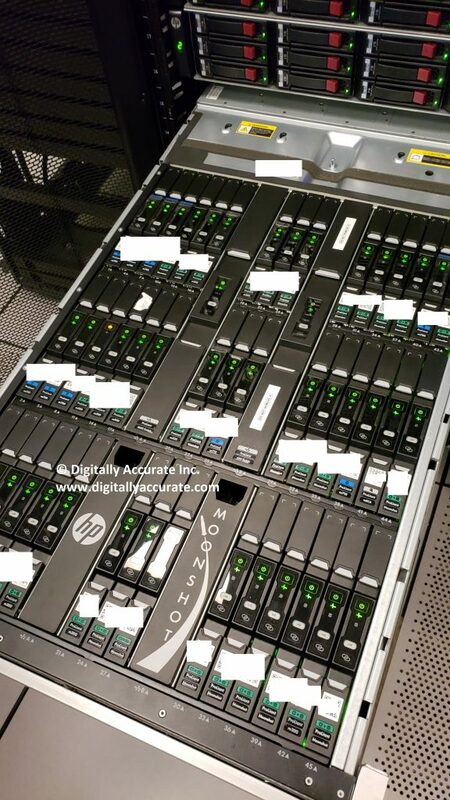 As mentioned above, Hosted Desktop Infrastructure hosts the End User Computing sessions on bare metal hardware in your datacenter (on servers). 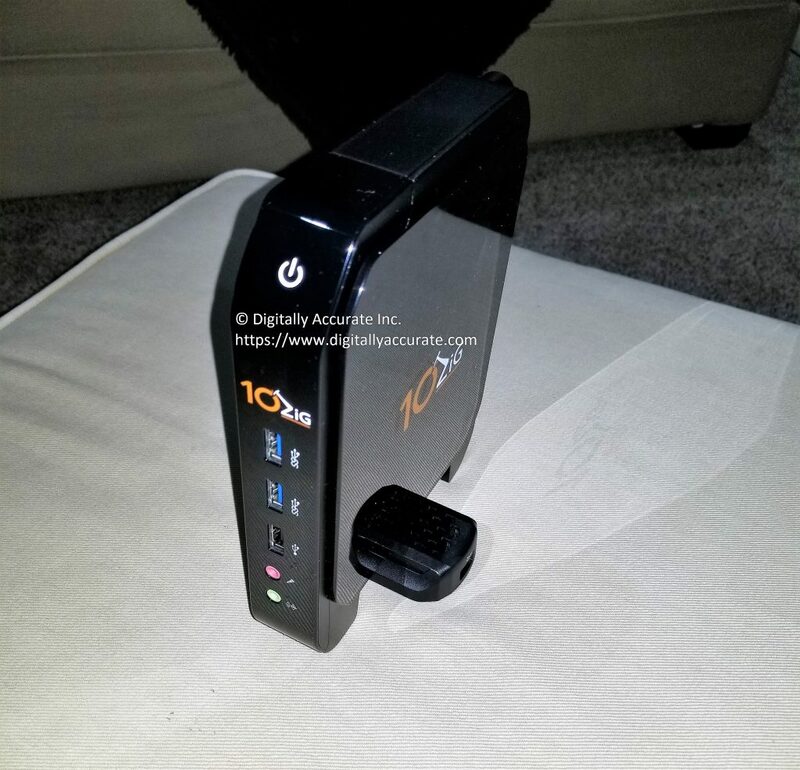 A connection broker handles the connections from the thin clients, zero clients, or software clients to the bare metal allowing the end user to see the video display, and interact with the workstation instance via keyboard and mouse. If you require dedicated resources for end users and want to be as cost-effective as possible, HDI is a great candidate. 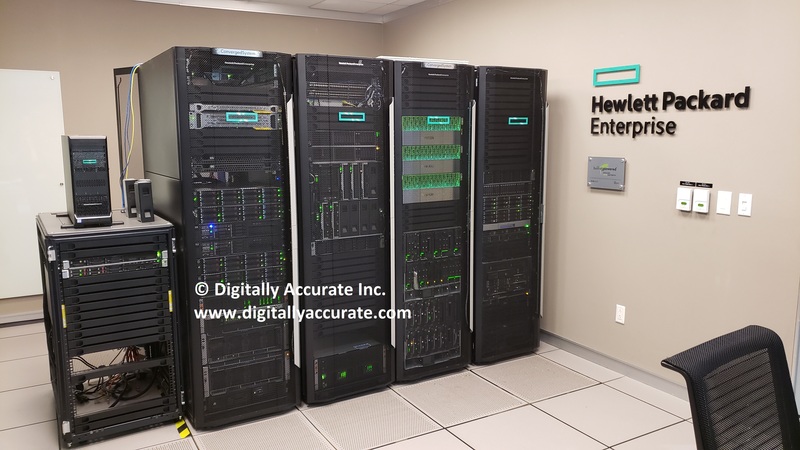 An example HDI deployment would utilize HPe Moonshot which is one of the main uses for HPe Moonshot 1500 chassis. 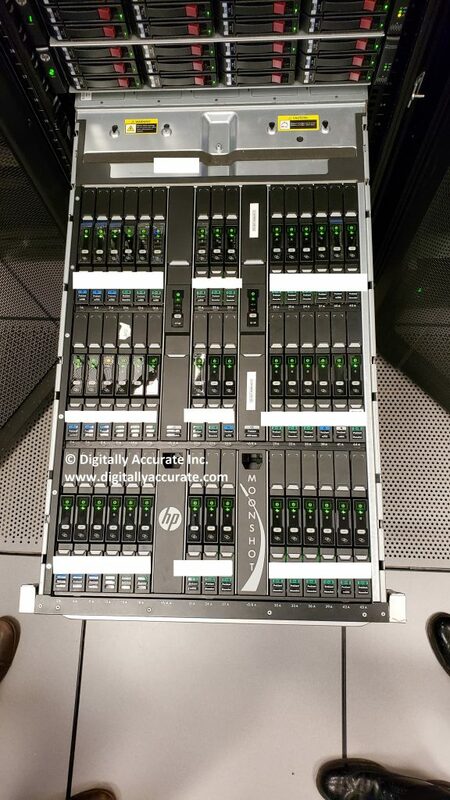 HPe Moonshot allows you to provision up to 180 OS instances for each HPe Moonshot 1500 chassis. Virtual Desktop Infrastructure virtualizes the end user operating system instances exactly how you virtualize your server infstructure. In VMware environments, VMware Horizon View can provision, manage, and maintain the end user computing environments (virtual machines) to dynamically assign, distribute, manage, and broker sessions for users. The software product handles the connections and interaction between the virtualized workstation instances and the thin client, zero client, or software client. If you want to share a pool of resources, require high availability, and/or have dynamic requirements then virtualization would be the way to go. You can over commit resources while expanding and growing your environment without any discontinuation of services. With virtualization you also have access to technologies such as DRS, HA, and special Backup and DR capabilities. Both technologies are great and have their own use cases depending on your business requirements. Make sure you research and weigh each of the options if you’re considering either technologies. Both are amazing technologies which will compliment and enhance your IT strategy. 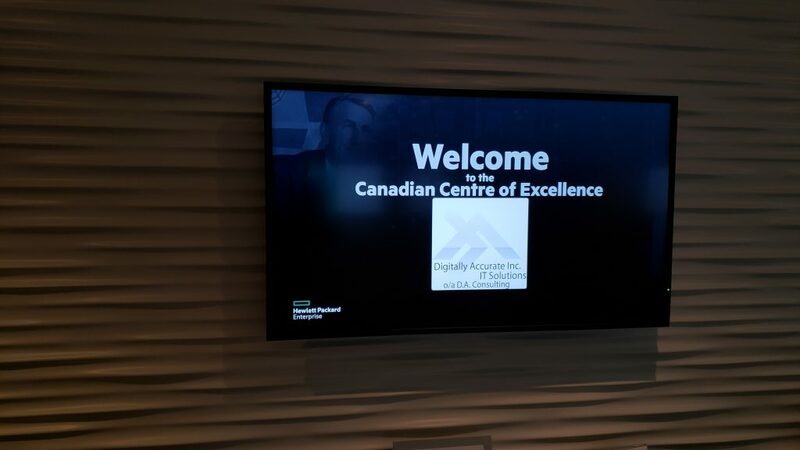 Recently we had the pleasure of visiting the HPe (Hewlett Packard Enterprise) headquarters in Toronto Ontario. During this visit we had a chance to talk tech, visit the Canadian Center of Excellence (CCoE), and discuss some of the product road maps moving forward. 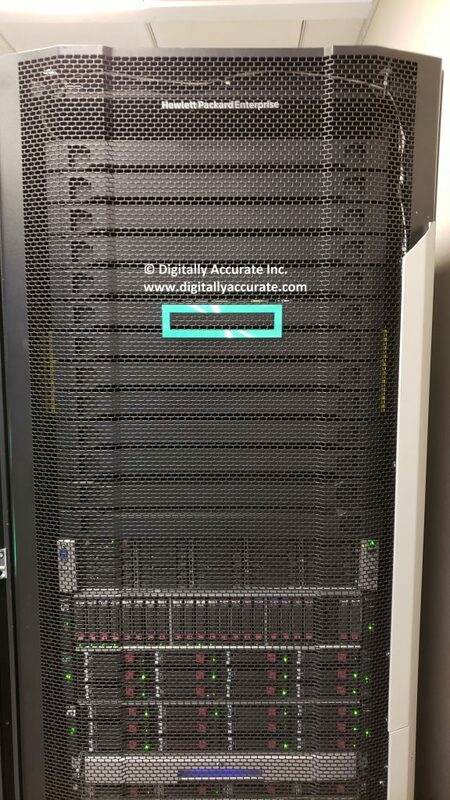 Digitally Accurate Inc. has been a long time partner of HPe, and we specialize in solutions that include HPe product. 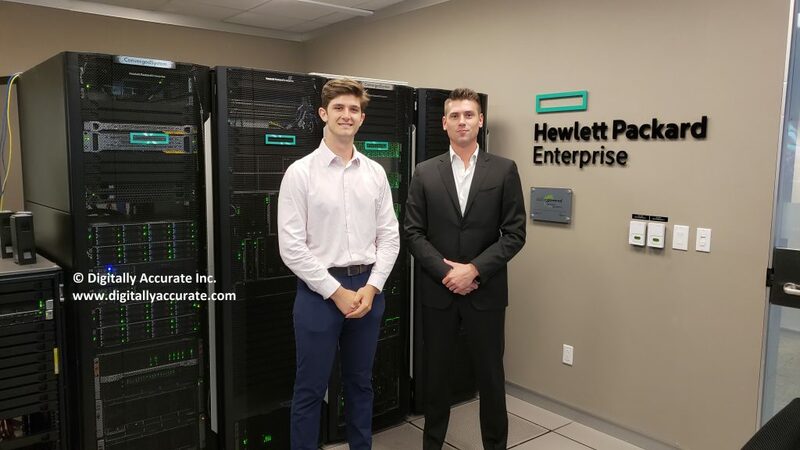 We’re looking forward to our continued partnership and work with HPe! A big thank you goes out to to Bob Wong, Christine Wang, Igor Samuk, Rob Drover, Jordan Nanos, Kyle Falzetta, Asha Wright, and Zachary Zicarelli for the invite and warm welcome! When you’re looking for additional or enhanced options to secure you’re business and enterprise IT systems, MFA/2FA can help you achieve this. Get away from the traditional single password, and implement additional means of authentication! MFA provides a great compliment to your cyber-security policies. 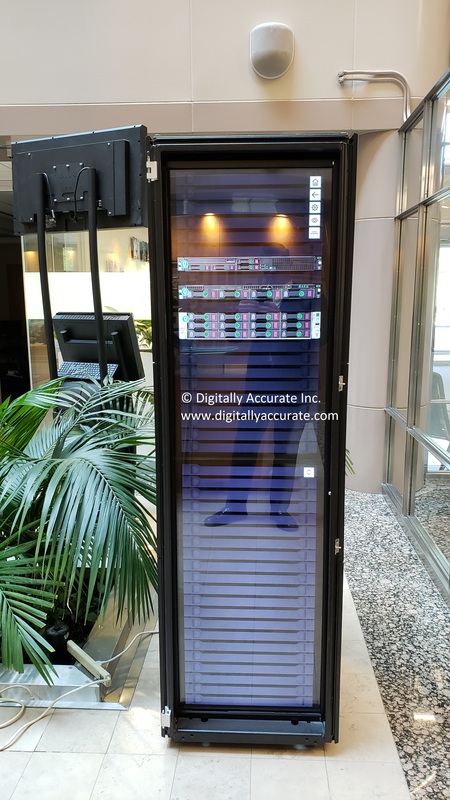 Here at Digitally Accurate Inc, we’ve been using the Duo Security‘s MFA product in our own infrastructure, as well as our customers environments for some time. 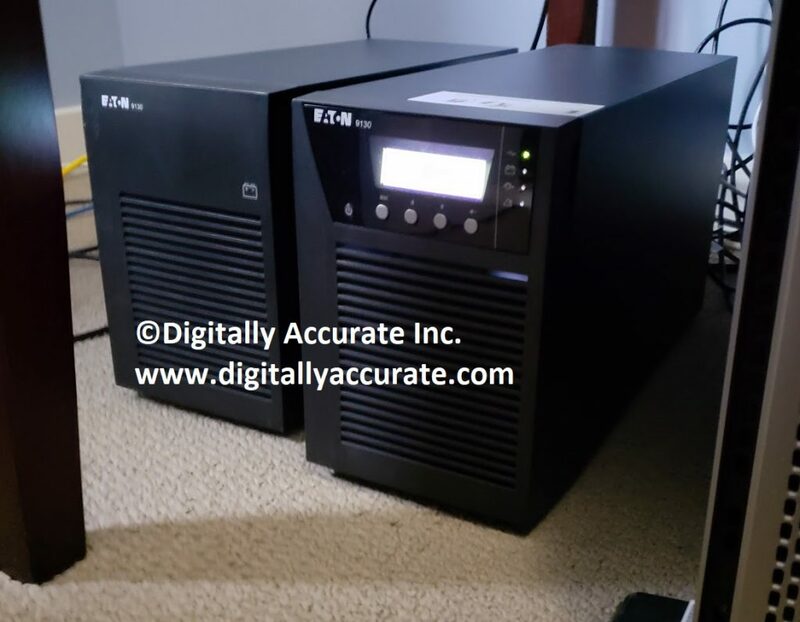 Digitally Accurate is a DUO Partner and can provide DUO MFA Services including licensing/software and the hardware tokens (Duo D-100 Tokens using HOTP). MFA is short for Multi Factor authentication, additionally 2FA is short for Two Factor Authentication. While they are somewhat the same, multi means many, and 2 means two. Additional security is provided with both, since it provides more means of authentication. Traditionally, users authenticate with 1 (one) level of authentication: their password. In simple terms MFA/2FA in addition to a password, provides a 2nd method of authentication and identity validation. By requiring users to authentication with a 2nd mechanism, this provides enhanced security. In a large portion of security breaches, we see users passwords become compromised. This can happen during a phishing attack, virus, keylogger, or other ways. Once a malicious user or bot has a users credentials (username and password), they can access resources available to that user. By implementing a 2nd level of authentication, even if a users password becomes compromised, the real (or malicious user) must pass a 2nd authentication check. While this is easy for the real user, in most cases it’s nearly impossible for a malicious user. If a password get’s compromised, nothing can be accessed as it requires a 2nd level of authentication. If this 2nd method is a cell phone or hardware token, a malicious user won’t be ale to access the users resources unless they steal the cell phone, or hardware token. When deploying MFA or 2FA you have the option of using an app, hardware token (fob), or phone verification to perform the additional authentication check. After a user attempts to logs on to a computer or service with their username and password, the 2nd level of authentication will be presented, and must pass in order for the login request to succeed. Duo Push sends an authentication challenge to your mobile device which a user can then approve or deny. Once the user selects to approve or deny the login request, the original login will either be approved or denied. We often see this as being the preferred MFA/2FA method. 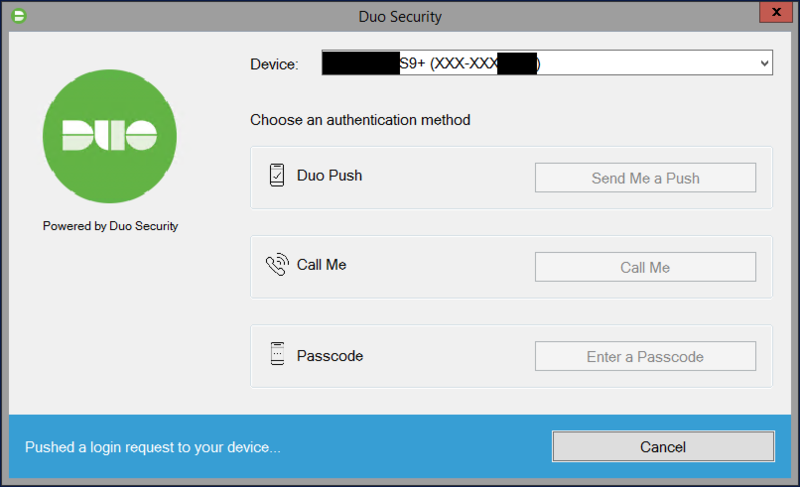 Duo phone verification (Call Me) will call you on your phone number (pre-configured by your IT staff) and challenge you to either hangup to deny the login request, or press a button on the keypad to accept the login request. While we rarely use this option, it is handy to have as a backup method. Duo Passcode challenges are handled using a hardware token (or you can generate a passcode using the Duo App). Once you select this method, you will be prompted to enter the passcode to complete the 2FA authentication challenge. If you enter the correct passcode, the login will be accepted. When you press the green button, a passcode will be temporarily displayed on the LCD display which you can use to complete the passcode challenge. You can purchase Hardware Token’s directly from Digitally Accurate Inc by contacting us, your existing Duo Partner, or from Duo directly. Duo is also compatible with other 3rd party hardware tokens that use HOTP and TOTP. While you can’t visibly see the option for U2F, you can use U2F as an MFA or 2FA authentication challenge. This includes devices like a Yubikey from Yubico, which plugs in to the USB port of your computer. You can attach a Yubikey to your key chain, and bring it around with you. The Yubikey simply plugs in to your USB port and has a button that you press when you want to authenticate. When the 2FA window pops up, simply hit the button and your Yubikey will complete the MFA/2FA challange. Duo MFA supports numerous cloud and on-premise applications, services, protocols, and technologies. While the list is very large (full list available at https://duo.com/product/every-application), we regularly deploy and use Duo Security for the following configurations. Duo MFA can be deployed to not only protect your Windows Servers and Workstations, but also your remote access system as well. Duo MFA can be deployed to protect your VDI (Virtual Desktop Infrastructure) by requiring MFA or 2FA when users log in to access their desktops. Duo MFA can be deployed to protect your Sophos UTM firewall. You can protect the admin account, as well as user accounts when accessing the user portal. If you’re using the VPN functionality on the Sophos UTM, you can also protect VPN logins with Duo MFA. Duo MFA can be deployed to protect your Unix and Linux Servers. You can protect all user accounts, including the root user. We regularly deploy this with Fedora and CentOS and you can protect both SSH and/or console logins. 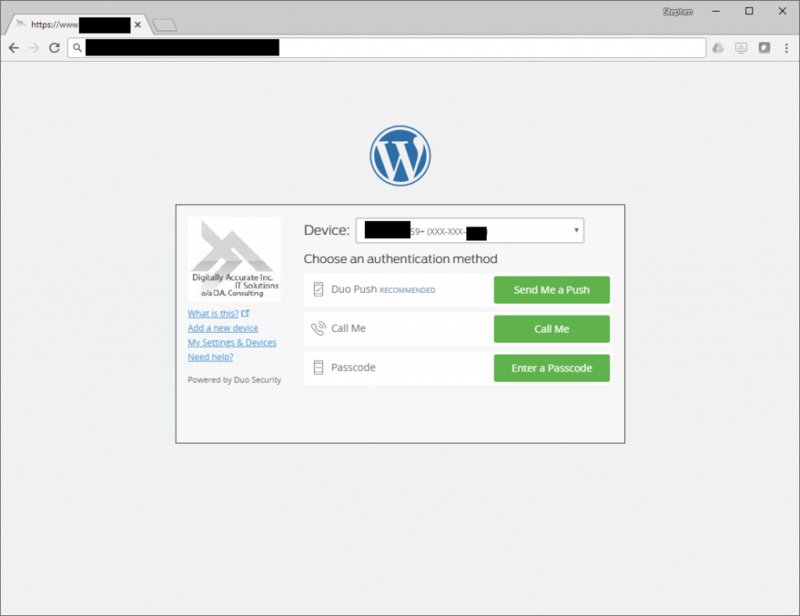 Duo MFA can be deployed to protect your WordPress blog. You can protect your admin and other user accounts. If you have a popular blog, you know how often bots are attempting to hack and brute force your passwords. If by chance your admin password becomes compromised, using MFA or 2FA can protect your site. Implementing Duo MFA is very easy and works with your existing IT Infrastructure. It can easily be setup, configured, and maintained on your existing servers, workstations, and network devices. Duo offers numerous plugins (for windows), as well as options for RADIUS type authentication mechanisms, and other types of authentication. 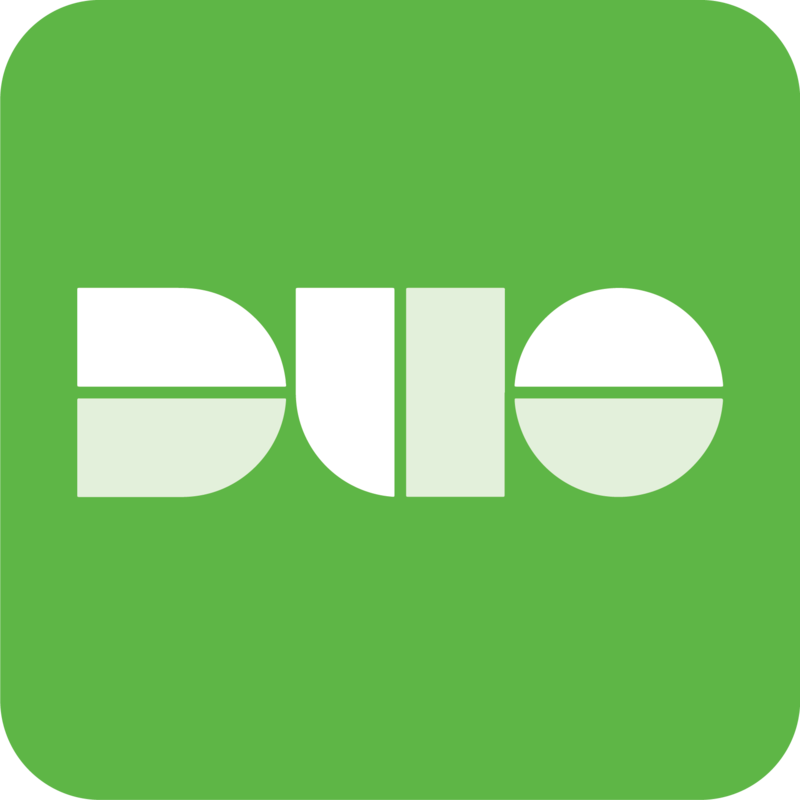 Duo is managed through the Duo Security web portal. Your IT admins can manage users, MFA devices, tokens, and secured applications via the web interface. You can also deploy appliances that allow users to manage, provision, and add their MFA devices and settings. Duo also integrates with Active Directory to make managing and maintaining users easy and fairly automated. Want to protect your business with MFA? Give us a call today! 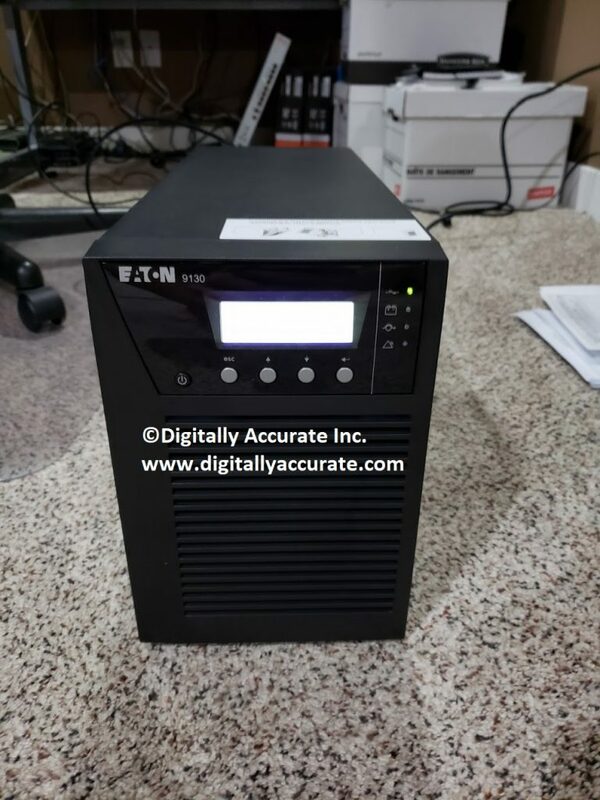 Today we want to share with you an Eaton UPS and EBM (Extended Battery Module) we recently setup for one of our customers. This provides all their server infrastructure 3 hours of run time in a blackout! Additional EBM’s can be added to increase run-time significantly. 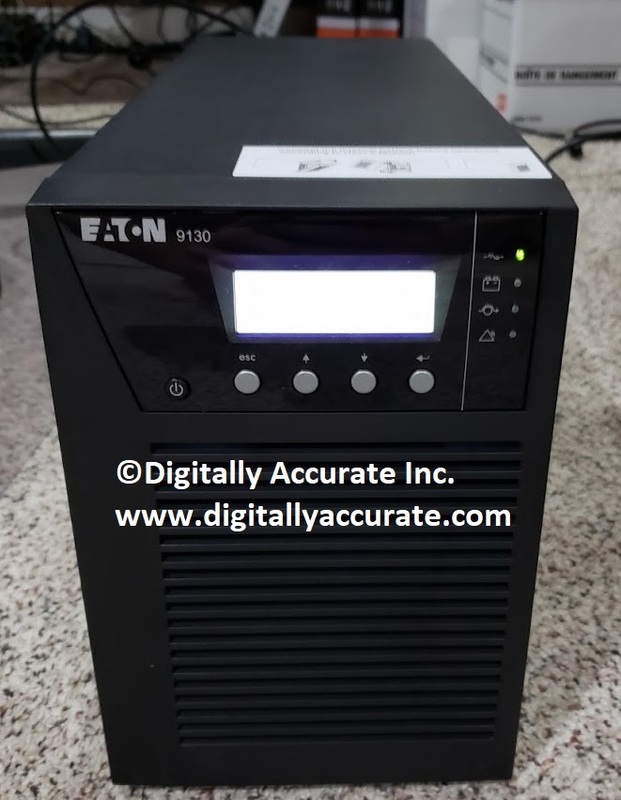 The Eaton 9130 uses double conversion to supply power to your equipment, and has an efficiency rating of over 95%. 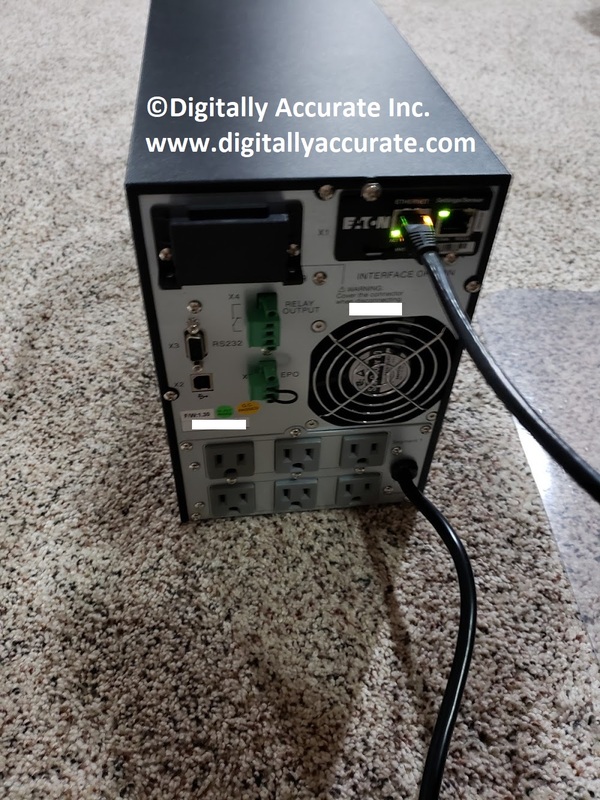 Contact us for your Eaton and/or IT power requirements! 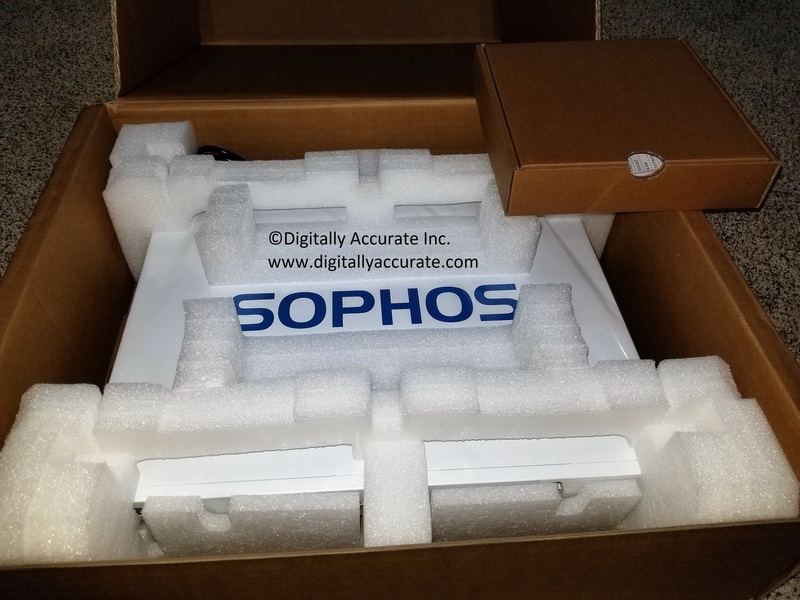 This weekend, one of our customers had an aging Sophos UTM 220 which was reaching it’s end of life (EOF). 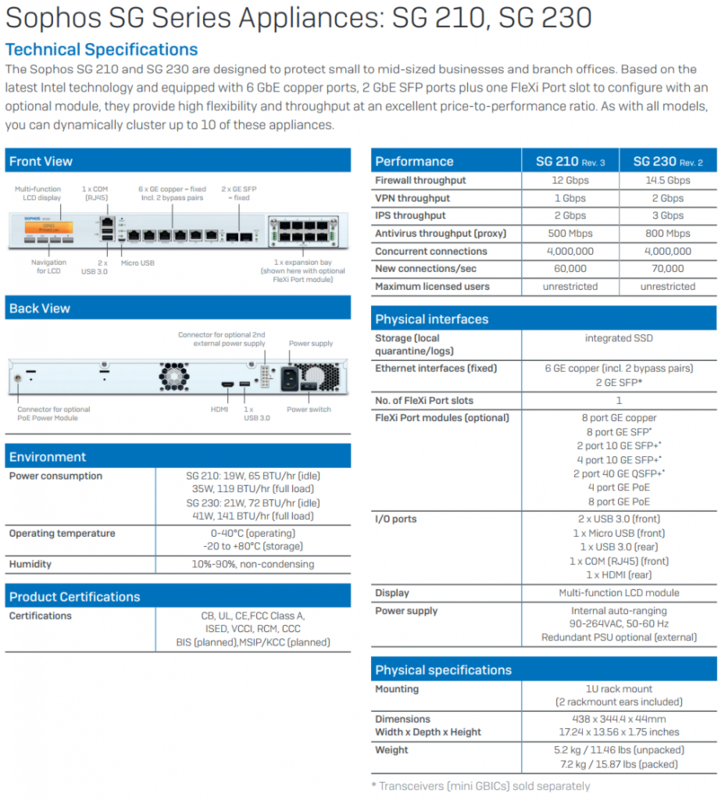 The upgrade path for the Sophos UTM220 is the new Sophos UTM SG 230. 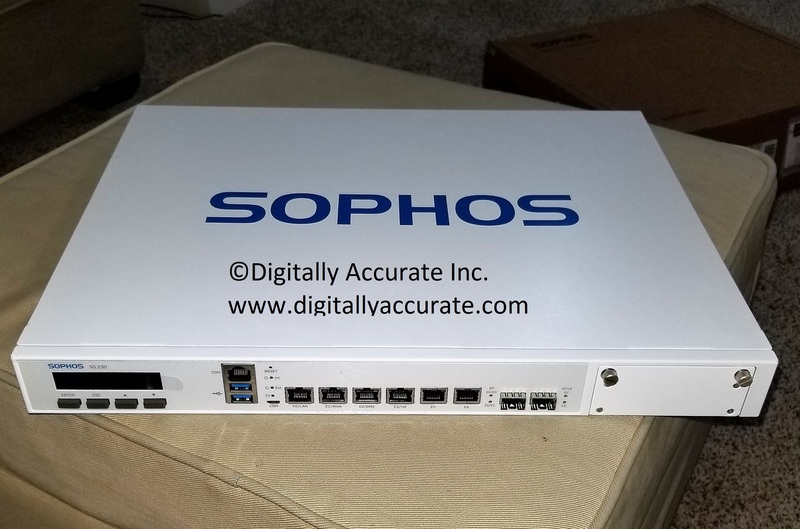 Digitally Accurate Inc. is a Sophos Partner providing hardware and services in Calgary, Alberta and Vancouver, BC. Contact us today! 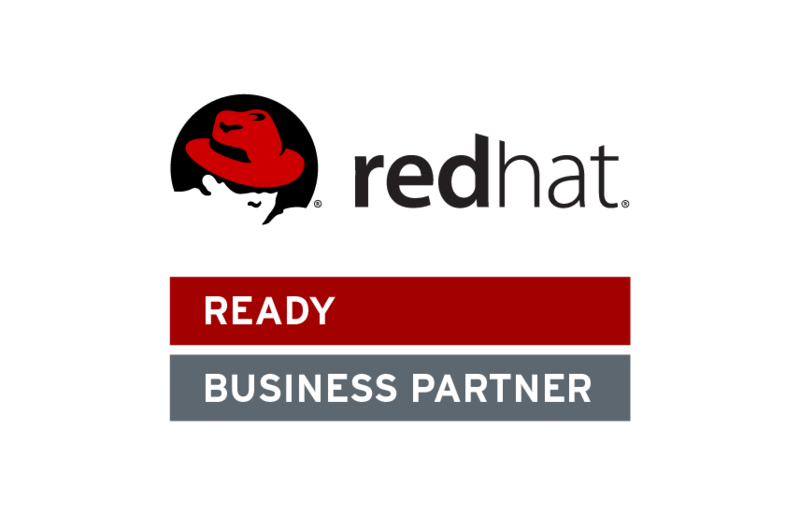 We’re proud to announce our partnership with Red Hat! Red Hat is the world’s leading provider of open source solutions, using a community-powered approach to provide reliable and high-performing cloud, virtualization, storage, Linux, and middleware technologies. By adding this partnership to our growing network, we continue to establish and maintain ourselves as a leading all-encompassing turnkey IT solution and managed services provider for businesses. We differentiate ourselves from competition by managing and advising both on the business and technical aspects of information technology, where our competitors usually strictly focus on the technical. 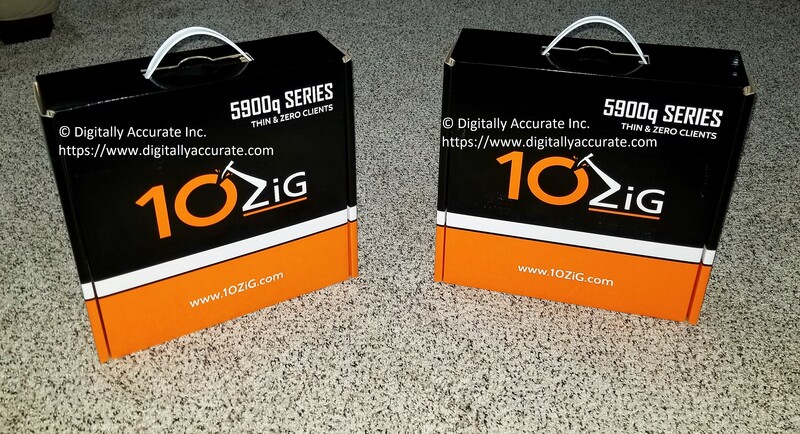 We received two of these units last Friday (from the 10ZiG 5900 series) for demo purposes and internal use at Digitally Accurate Inc. These zero clients are perfect for corporate desktop virtualization, and these specific models are targeted for power class users who require high performance from their VDI environments. The 5948q achieves this by supporting 3 displays at 4K UHD, Gigabit Ethernet, and USB 3.0 ports. For our demonstrations, we are using these zero clients with VMware Horizon View (the part number for the device with the VMware Horizon firmware is 5948qv). Our specific unit shipped with 4GB of RAM, however they can be ordered with 8GB of RAM. We were very pleased at how well put together these devices were (heavy metal feeling, no light plastic), and they are extremely visually appealing. 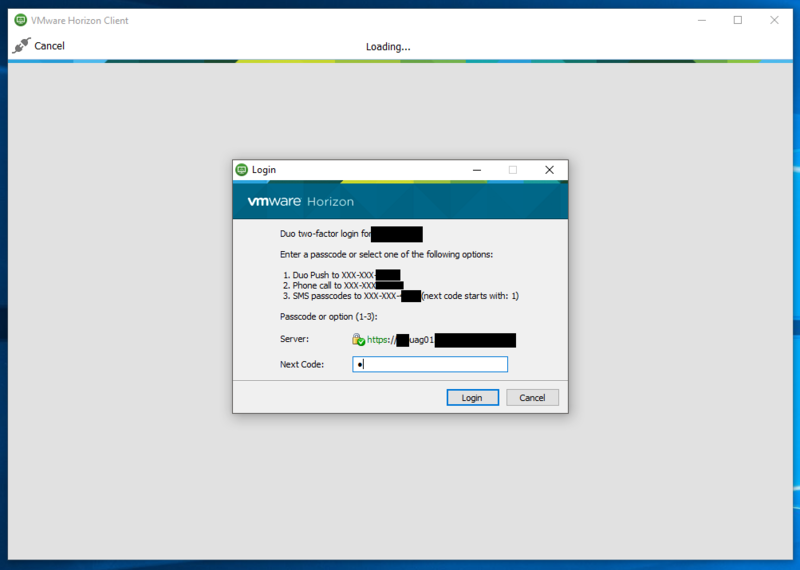 While we specifically purchased these for use with VMware Horizon View, they can also be used with Citrix, RDP, and Parallels RAS technologies, are all easily switchable with the 10ZiG Manager (deploy firmwares on the fly). You can also order the devices shipped with your firmware of choice. 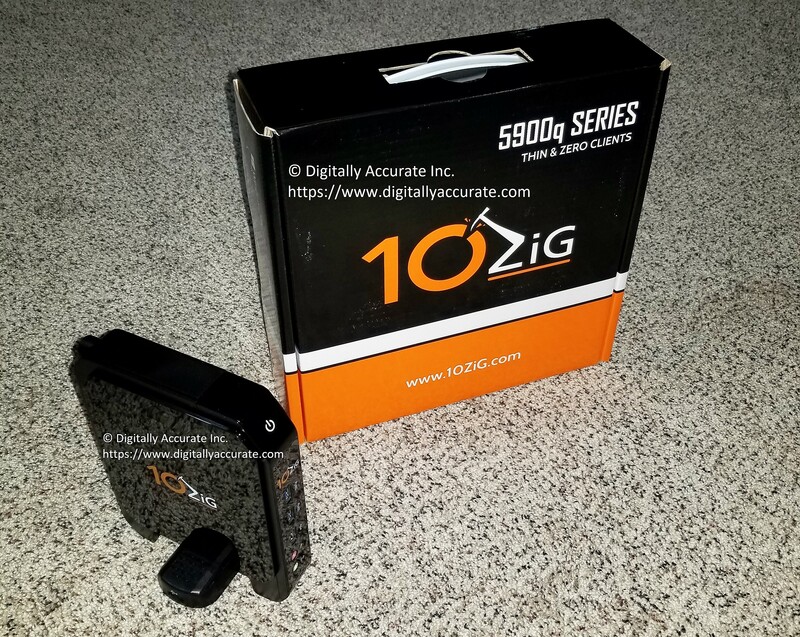 Contact us today for a demo, or if you’d like to purchase any 10ZiG products! Digitally Accurate Inc. is based in Calgary and Vancouver and is a VMware solution provider, and 10ZiG partner. Contact us for anything VDI related! In today’s use case scenario, a machine shop has a requirement for many workstations with high-end compute and GPU requirements. Instead of spending a fortune on many high-end workstations and having those resources sit idle and wasted when not being used, the company could implement desktop virtualization (VDI) with VMware Horizon View on HPe proliant servers with accelerated graphics using AMD MxGPUs. Then simply roll out 10ZiG Technology zero clients! The result? A small fortune saved! In an environment with 20+ workstations, the company could realize up to 50% in cost savings on hardware. Digitally Accurate Inc. is a Calgary and Vancouver based VMware solution provider partner! Contact us today for more information on Desktop Virtualization, VMware vSphere, VMware Horizon View, or 10ZiG Zero Clients. 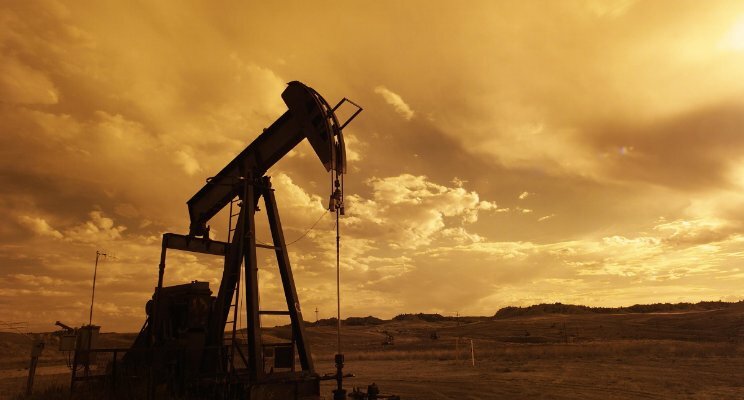 While cyber-attacks aren’t anything new and are part of everyday business risk, the increased number of attacks against the Oil and Gas industry is alarming. Traditionally when companies get “hacked”, for the most part it’s software bots scanning the internet for companies that have unpatched servers or open security holes (for example, Equifax was hacked due to an unpatched Apache Strut vulnerability). When it comes to Oil and Gas, the stakes are higher, and so is the payoff. Hence, why more and more businesses in the energy sector are coming under attack. When there’s a specific target the above methods are still employed, however there’s the added vector of the individual and human factor actually putting effort in to compromising the systems. The added human factor bringing potential social engineering, expertise, and putting all their effort into a single target, with sometimes numerous individuals, is what makes this so dangerous. Finally, actual hacker groups often have access to “0-Day vulnerabilities”. These are vulnerabilities that haven’t been discovered to which the software developer hasn’t created a patch for. These are often used when groups are specifically targeting an organization, person, or entity. With the decline and recession of the energy industry from 2014 to 2017, numerous companies have reduced (and in some rare cases even completely cut) their IT budgets. This includes laying off staff which actively monitor these systems, changing IT providers, and even moving to external resources (such as cloud providers) so that the company doesn’t have to maintain their own systems. This dynamic and changing approach to IT has had its own consequences. Numerous businesses have removed most of their IT infrastructure just because they have moved to the cloud, removing all their internal IT security systems which are still required no matter where their data is stored. These systems include centralized endpoint (computer) protection, perimeter protection (corporate firewalls and unified threat management systems), active monitoring systems (monitoring the environments and security), and the infrastructure that make all these systems work. Even though some of these companies now have small or no data on their actual physical network, their credentials have become very easy to compromise, which allows attackers to access their cloud resources. They’ve essentially stripped away numerous security layers. The recent hack on Deloitte brings emphasis to the ease of compromising some cloud based systems. The attacker gained access to their Microsoft-hosted e-mail mailboxes by getting access to the main single administrative account (username and password) which controls everything. I firmly believe in general situations that staff actively monitoring these systems could identify and stop intrusions, even stopping them from ever occurring. I also believe it would have been a different story with everything on-premise, restricted behind firewalls, perimeter security, and the complexity of the attacker not knowing or being familiar with the internal corporate network. In addition to the move to cloud resources to save costs, companies have changed IT providers for low-cost “discount” providers. These companies advertise as providing the same services that a company is accustomed to receiving but at a fraction of the cost. These providers often don’t provide the same services, outsource support/services to other 3rd party companies (sometimes in other countries), store sensitive information on 3rd party servers, and don’t take security seriously since they focus on the number/volume of their client base and not on the quality of their work. With the added pressure of clients restricting budgets, these companies can sell and implement incorrect solutions that are often sized for a different type of business. All of this contributing to their security vulnerabilities. Traditionally, Oil and Gas has always been big bucks! As situations and issues have arisen, money was often thrown at these issues to resolve them, this also being true with their IT systems. Over years and years, management at these companies would rarely get involved, just paying bills expecting it to work. With the decline and recession in the industry, they just assumed that they could get the same service when switching to discount providers mentioned above or migrating to cloud based resources. Oil and Gas has always had strict IT requirements. This is due to the sensitivity of the data, compliance requirements (with regulatory bodies, associations, health and safety), value of intellectual property, adhering to governmental privacy and information acts, and investments they’ve made in big data. Additionally, due to political factors and human factors (such as environmentalism), the industry has always been under heavy scrutiny for liability (which requires even more care in maintaining and protecting data and records). This all adds to the need to protect this data. So here we are approaching Q4 of 2017 at a time when the industry is finally picking up. Cash is starting to flow, as well as the oil in pipelines, and with the growing cyber security risk on the rise, it’s a dangerous combination that businesses need to be aware of. Businesses and organizations need to pay special attention to their IT systems. Management needs to be actively involved, educated, and asking relevant questions. When things don’t seem right, it’s for a reason. Not having a proper budget or resources for IT is like removing the insurance policy on millions of dollars worth of assets and equipment. You wouldn’t do the latter, so why do the former. Why would you put your IT systems that run your business and operations at risk?